National History Park - Citadel, Sans-Souci, Ramiers is the largest fortress in the Western Hemisphere, and was built when Haiti became a free republic. The Sans-Souci Palace was the royal residence of King Henri I (better known as Henri Christophe, a key leader during the Haitian slave rebellion) of Haiti. Construction of the palace started in 1810 and was completed in 1813. The Citadelle Henri Christophe, known as Citadelle Laferrière is a large mountaintop fortress. It was built by Henri Christophe after Haiti gained independence from France at the beginning of the 19th century. 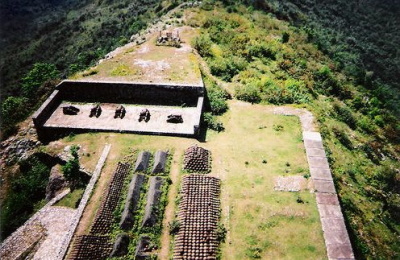 The massive stone structure was built by up to 20,000 enslaved workers between 1805 and 1820 as part of a system of fortifications designed to keep the newly-independent nation of Haiti safe from French incursions. We have been to Haiti 16 times with Mission to Haiti Canada, and only once to the Cap-Haitian area. We lodged in Fort Liberty, and did medical clinics in a nearby church. We took a bus to the Citadel area, then small horses up the long and winding path up the mountain. Some of our group if 12 took motorbike rides up as they had run out of horses. Our 2 guides were very kind and did walk all the way up the hill with us, one leading the animal, and the other at the tail end, keeping us centered on the animal's back at all times. I think they were taking turns reciting memorized chapters of the Psalms to pass the time as they were walking. The scenery was beautiful, though it was a bit foggy. 'The guide' for our group was very informative, and eager to tell us all about each corner of the citadel and surroundings. He did a great job! The trip was well worth it, and probably a once-in-a-lifetime experience. The trip down the mountain was probably more challenging for us than the way up, as the stones were wet from the misty rain that was falling, and the horses' hoofs often slipped. But our walking 'helpers' were quick to steady us by grabbing our arm and asking if we were alright. All in all, it was an awesome experience to be up there and the Haitians must have worked very hard to get all the stones in place to build this world-wonder in such a short time! Sometimes a journey is more interesting then the destination. All the reviews are wonderful but many things have happened to Haiti since and so I hope this review will be of interest to some. I was in Santo Domingo for a business meeting last weekend and I flew in on Friday night. We were done by Sunday night and all the participants left on Monday except that I wanted to visit the Citadelle in Haiti. I had two days to do it as I have another appointment back in the US on Wednesday. After a lot of preparation using the internet, I determined that there is a bus service from Santo Domingo to Cap Haitien. The bus company is Caribe Tours and so I booked a ticket for Monday morning. When I called them on Saturday, they informed me that even though they are quite regular, they only go to Cap Haitien when there are enough passengers and they would let me know on Monday morning. That screwed up my plans and so I asked the concierge at the hotel to find me an alternative. She found me a tour company that was willing to provide a private transfer but at $US 370 which is 10X the bus fare. I had no choice at this point and coughed up the money. We took off on Monday at 10am after I paid the fare and I sensed that this will be an interesting trip as the driver did not speak English and he has never been to Cap Haitien before. By 3pm we were at the border at Dabajon. This when it starts to get interesting. First the driver was told that the paper work on the van was incomplete and that the van could not leave DR. A lot of discussion later, with the help of a self appointed fixer who appeared on the scene, we went looking for a telephone company that can receive a fax from the tour company. Everything takes a long time and one and a half hours later, we were back at the border. The next wrinkle was that the driver's passport is not in order and he cannot cross the border. It took another half hour for the fixer to fix the problem. In the meantime my passport went through several hands and $US 25 was taken from me for a $US 20 exit fee and $US 5 for the fixer. Then as we were ready to drive across the one lane bridge, a dozen important looking individuals would surround the van asking all kinds of questions, looking at the documents and my passport. In the end the driver informed me that they wanted $US 120 to let the van cross the border. I told him that I was not prepared to pay and a lot of discussion ensued for 15 minutes. In the end they gave up and waved us on. Once across the border, the fixer took my passport and got me an entry to Haiti for $US 1. All looked good before another half dozen individuals surrounded the van and indicated that the van was not authorized into Haiti. A lot of discussion goes on in French and the fixer indicated that everything can be solved for $US 30. I told him that this was the last straw and gave him the money. He pockets $US 10 and gives $US 20 to the head of the gang. They laugh and throws the money on the floor. Within 15 seconds, he changes his mind, picks up the money and waves us off. All this has taken 2.5 hours and we are now in Haiti. There are no roads at the border except a dirt track. However after we entered the town, the roads were remarkably good to Cap Haitien. Once we got into the city, there was no more road. The city is dirty, dusty and reminds me of being in Africa. Haiti is completely different from the rest of the Carribean. The descriptions of the Citadelle are well documented with two additional impressions. The horse ride for the last 30 mins to the Citadelle was a lot of fun and the views on top of the ramparts were breath taking. My exit from Haiti was uneventful. I took a commuter flight from Cap Haitien to Port-au-Prince on Tortug Air (book on-line) and then on to Miami. I suspect that if you do not want to go through my hassles, take the bus or go through P-au-P and avoid the border. Cap Haitien was remarkably calm given the political situation, aftermath of the earthquake and cholera. My journey to the Citadel started with a young lady in 1979. I had barely heard of Haiti and we had only enough money for a one-way ticket from St. Maarten to Port au Prince. What a fine adventure! A bus ride to Cap Haiten where she knew of a delightful hotel of windows with no glass. Riding on top of Tap Taps we eventually got to the donkeys for the trip up to the Citadel. Children appeared out of the woods to serande us up with long-tubed wooden horns (much longer than they were tall) that bellowed like fog horns. We were "welcomed" to the fort by what was once a dog now being washed for dinner as it hung outside a tower window. The forts' chamber were ghostly beautiful; ornate cannons ready to fire mounds of cannon balls at French phantoms. We were told that syphilis-mad Henri Christophe once ordered an entire regiment to march off the fort's wall to their death. Thanks to Kippi Dupont and his plane, we were able to leave Haiti but I'll never forget those three days or the magnificent Citadel! I visited Haiti in the fall of 1955. We stayed at the Ibo Lele Hotel in Petionville. At that time, as I recall, a relative of, I think, Teddy Roosevelt was the owner or manager. We took a trip up to Cap Haitian in a DC-3 and got on mules for the climb up to the Citadel. First we stopped at San Souci. I had never been on a horse and I was sure I'd fall off the mule, but as we went along it got better. There were several local men who walked up the mountain with us, barefoot. On the way they taught me one Creole expression. In French, "the same thing" is "meme chose". They told me they said "meme bagai". Many years later in New York City when I'd get a taxi driver who I thought from his name might be Haitian, I told him the story and it always invoked a laugh. I was there while Magloire was president. The country was poor, but not devastingly so. I also worked for a non-profit organization which helped a women's clinic in Cite Soleil. I have good memories of Haiti, learning to do the meringue, visiting the church with the murals, buying souvenires at the Iron Market. That Port-au-Prince no longer exists. Very sad. My interest in Haiti is newly aroused after the earthquake last week in Port au Prince. I recall my trip there in the 1970's. Flying out of Detroit, MI, with the Nomads Air Travel Club, we land at the North Shore city of Cap Hatitien. Our mountain-top destination is to be the massive foreboding fortress of the Citadelle, reached only by a narrow rocky path worn into the side of the steeply rising mountainside. To aid us in this exciting adventure, each of us hire a local Hatian guide, and a small, sure-footed little donkey. The friendly and helpful Haitiens carry our cameras, water, and either lead our donkey, or occasionally switch him on the behind to urge him on a little faster. As we reach the higher elevations, the Citadelle comes into view through the trees, growing bigger at each glimpse. At the top, the scene is breathtaking. The massive stone structure of the Citadelle against a blue sky above, and the sparkling blue Atlantic below makes one feel as tho one is standing on the top of the world, and can see forever. I consider this as one of my favorite adventures of my travels in life: the people, the history, the scenery. This is indeed one of the "Treasures of the World." Haiti itself is a fascinating destination but perhaps not everyone’s taste – and, at the time of writing (Feb 2005), perhaps not totally safe. But, even if you don’t want to give Haiti a “full trip” then Cap Haitien itself is easily visited from the Dominican Republic. – allow a day to get there, a day to see the WHS and a day to get back. First take a bus or taxi to the border town of Dajabon – either from Santo Domingo or from one of the beach resorts on the NE coast. Walk across the border to Ouanaminthe and you are in a different world. You leave the Dominican Republic with its received US culture, its fast food chains, baseball and cast-off US Greyhound buses and enter the closest you will get to “Africa” on that side of the Atlantic. We were welcomed to Haiti with hens being sacrificed on the steps of the immigration hut. Your “bus” to Cap Haitien will probably be a lorry which you will share with a 100 others. In Cap Haitien you will be dropped in a crowded and poverty stricken market – you will wonder what you have got yourself into!! In fact Cap Haitien has 2 nice and reasonably central hotels to which you can escape if you wish:- the “colonial” Roi Christophe and the Mont Joli. The WHS is about 20 kms away in Milot – get there either by taptap or by taxi (much easier if you are short of time – and he should wait or come back to pick you up as well). In front of you are the remains of Henry Christophe’s Palace of Sans Souci, finally completed in 1813 and deliberately named after Frederick the Great’s palace in Potsdam. On 1 day in 1811 the self proclaimed King Henry I created 4 princes, 8 dukes, 22 counts 37 barons and 14 knights to “staff” his kingdom! In the halls and corridors of this Sans Souci the new nobility followed the rules of dress and behaviour laid out in Henry’s “Almanack Royal d’Haiti” - white tunic, red shoes, gold hilted sword etc. Varying colours delineated rank! The palace was ransacked after his downfall and destroyed by an earthquake in 1842 – but the outlines of its “Versailles-like” facades, stairs and colonnades are still there – a magical place. 5kms away and 900metres above the palace you will see the other great sight – The Citadelle. You might persuade your taxi to drive the first 3.5 kms (we didn’t! ), alternatively walk or rent a horse. The road/track is flanked by Haitian houses and the walk enables you to meet the locals but it is a hot climb! Unlike the Palace, the Citadelle has been restored. Its “massiveness” is intimidating and the brutality involved in its construction can easily be imagined. Enormous piles of cannonballs still stand ready for use by the 100 cannons still in place. In fact the Citadelle never had to face the return of the French it was built to oppose. Inside you will see the burial place of King Henry – he committed suicide to avoid being captured by his fellow Haitians who rebelled in 1820 and his body was buried at his request in quicklime - a tablet marks the spot. The views over Haiti and the coast are magnificent. The UNESCO site states “The Palace of Sans Souci, ….and, in particular, the Citadel serve as universal symbols of liberty, being the first monuments to be constructed by black slaves who had gained their freedom”. How wrong they are and what “politically correct” rubbish!!! Famous suicides: Sans souci Haiti - Crippled by a stroke, King Henri I committed suicide on the grounds of the palace on October 8, 1820.